Kevin Fitzsimmons, professor of Soil, Water and Environmental Science, recently returned from a Fulbright Research Fellowship to Vietnam and Myanmar and is sharing his experience. Fitzsimmons pioneered a new concept within the Fulbright Program as a regional research specialist, in this case with the Association of South East Asian Nations (ASEAN). While he spent most of his time in Myanmar and Vietnam, hosted by Yangon and Nong Lam Universities respectively, his activities also took him to Malaysia, Indonesia, Cambodia, India, China and even Ireland. The focus of his Fulbright research was the development and testing of alternative ingredients to fish meal and fish oil, striving to make aquaculture feeds more sustainable. With rapidly rising prices of fishmeal and fish oil, and declining supplies from the ocean, more sustainable alternatives are of critical importance. This is especially true in South and Southeast Asia where seafood is the primary animal protein source for more than 2.5 billion people. One of the goals of the Fulbright Fellowship was to educate faculty, students, farmers, and the feed industry about the need to utilize these alternatives and to provide connections to the industries providing these ingredients. Algae companies, biotechnologists with single cell proteins, and insect farmers are marketing a plethora of new protein and oil products capable of substituting for fishmeal and oil. Another goal was a collaboration to establish a Feed Innovation Network (FIN) of research and demonstration centers, matching U.S. and ASEAN institutions, starting with the U.S. Fish and Wildlife Service Fish Technology Center in Montana and the University of Arizona together with Yangon and Nong Lam Universities. The network would be a mix of a virtual network with web-based databases and research protocols and a physical network of small feedmills with tanks, ponds and raceways enabling the network to quickly design diets, evaluate novel ingredients, and test diets on fish, shrimp or crabs in a typical farm growing environment. The Fulbright Fellowship was an outgrowth of Fitzsimmons’ three year USAID project in Myanmar and his role as an organizer of the global F3 Feeds competitions. 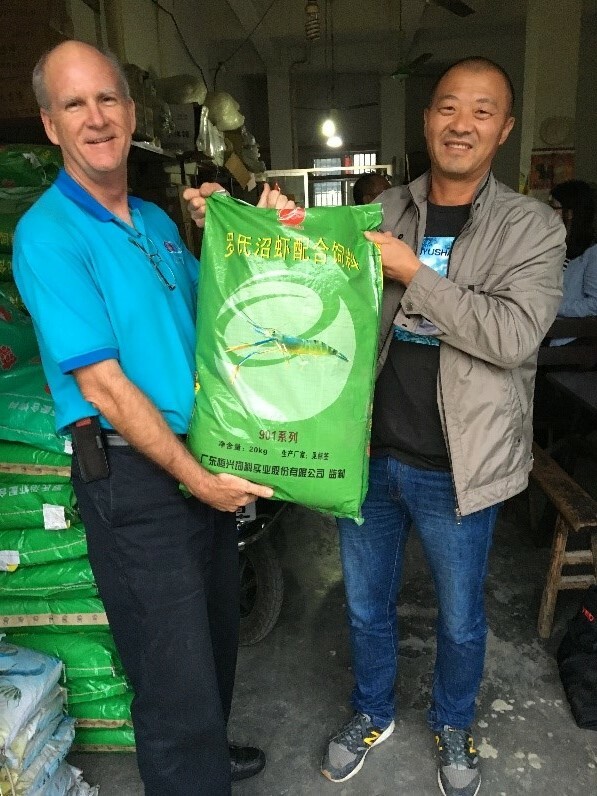 Fitzsimmons, the F3 spokesperson, recently awarded the inaugural prize for the F3 Fish Free Feeds contest to Evergreen Feeds Company of Guangdong, China. The prize was awarded at the October GOAL (Global Outlook for Aquaculture Leadership) meeting in Dublin, Ireland. The F3 is a series of global contests in which feedmill companies around the world are using novel ingredients and formulations to replace fishmeal and fish oil in aquafeeds. In the first contest, Evergreen sold more than 83,000 metric tons of tilapia and carp feeds with no fish meal or oil in 18 months to take the first prize of $200,100. In October of 2017, Fitzsimmons was a speaker at the Eleventh World Symposium on Nutrition and Feeding of Finfish and Shellfish in Huzhou, China, where he announced a new contest to promote the sales of alternative ingredients to substitute for fish oil in aquafeeds. In this contest, companies producing algae products, single cell bacteria and yeast products, insect farmers and animal by-products will compete to determine which company will be able to sell the most of their qualifying oil products to be used in aquafeeds. The prize for this contest has already risen beyond $100,000 with groups and individuals adding to the amount as crowd source funding at the F3 website https://f3challenge.org/. During the China visit Fitzsimmons also visited feed mills and farmers in Zhejiang Province to present the concepts and environmental benefits of the sustainable feeds. The judges in the contest are Fitzsimmons, Michael Tlusty from the University of Massachusetts and Chris Oakes from Synbiobeta. Sponsors of the contest were Monterey Bay Aquarium, New England Aquarium, World Bank and the University of Arizona. Major funding has been provided by World Bank, several environmental NGO’s and the many individuals at the crowdsource funding page. One of the acknowledged successes of the F3 effort has been the involvement of several NGO’s who have strongly supported the effort with cash and logistical support.